For a significant number of Americans, the reality, causes and meaning of global warming are seen through the lens of their religious beliefs. Some reject the evidence that humans are causing global warming because they believe God controls the climate. Others believe that global warming is evidence that the world will be ending soon, and that we don’t need to worry about global warming in light of the approaching apocalypse. To assess the level of acceptance of these beliefs among Americans, we surveyed a nationally representative sample of 1,204 American adults in March, 2016. 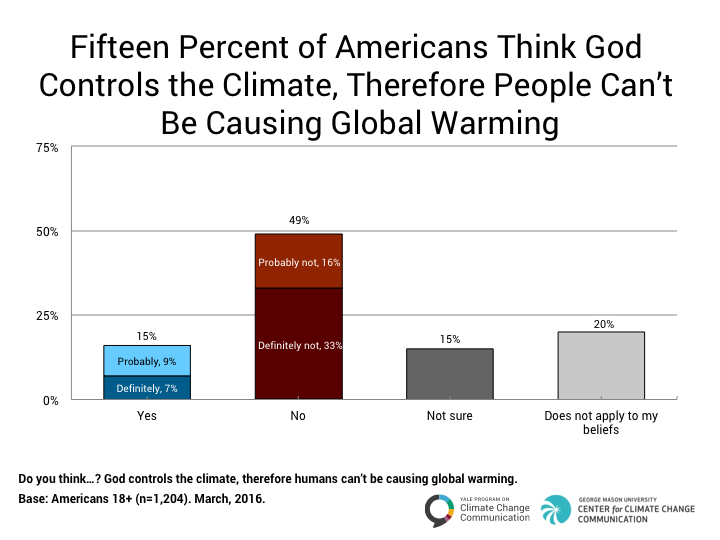 One in seven Americans think it is definitely (7%) or probably (9%) true that “God controls the climate, therefore people can’t be causing global warming.”Total “yes” responses = 15% as a result of rounding. People whose household income is less than $30,000 annually (21%)To see the results for all groups examined, please download the Data Tables PDF. 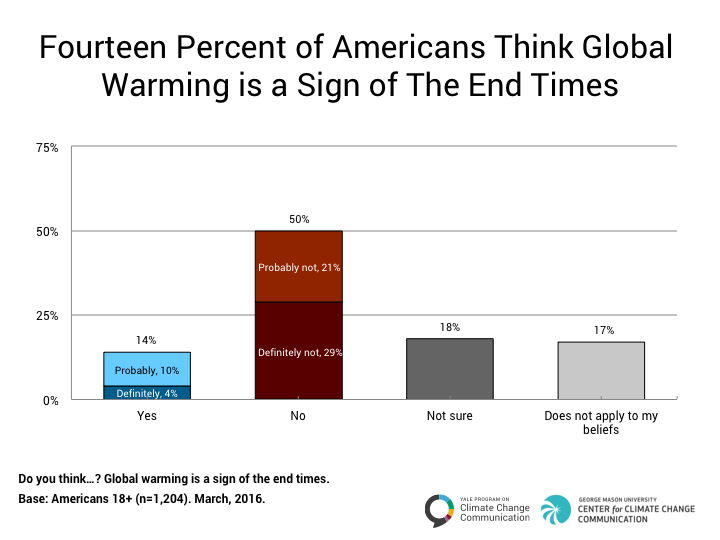 Global warming is interpreted as a sign of the end times by one in seven Americans, with 4 percent saying this is definitely so, and another 10 percent that it is probably so. 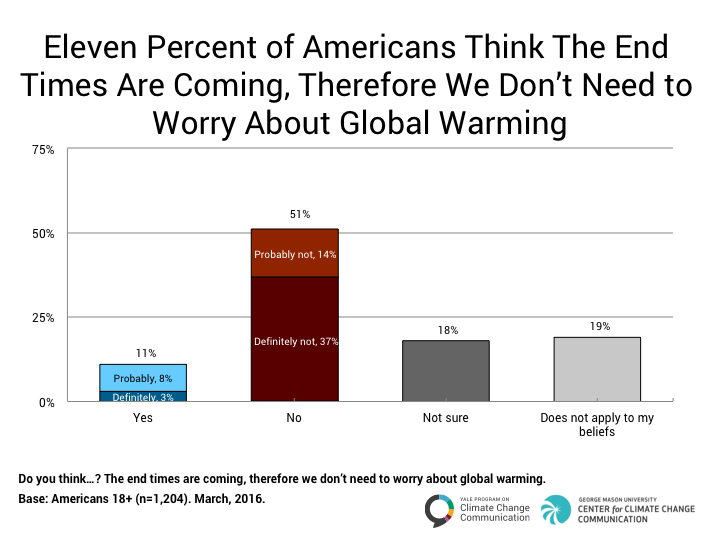 Just over one in ten (11%) think the end times are coming, therefore we don’t need to worry about global warming. 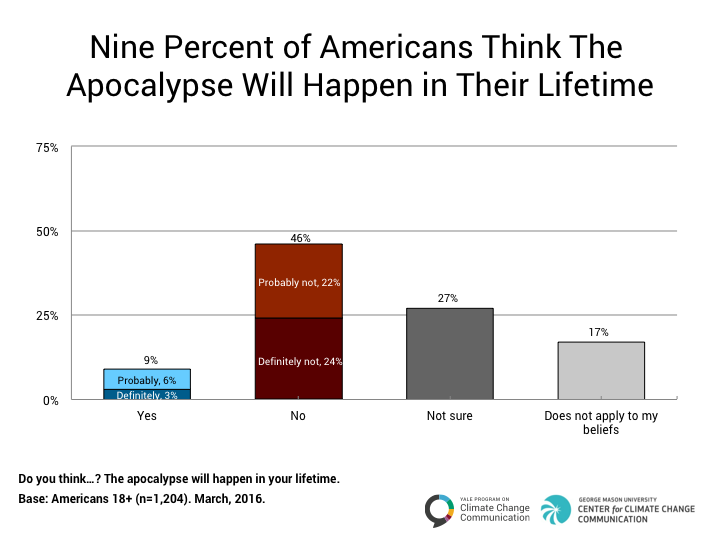 Close to one in ten Americans (9%) think the apocalypse will happen within their lifetime. Roser-Renouf, C., Maibach, E., Leiserowitz, A., & Rosenthal, S. (2016). Global Warming, God, and the “End Times”. Yale University and George Mason University. New Haven, CT: Yale Program on Climate Change Communication.